I am aware how difficult it is to make beans look appetizing in a picture, so I made sure you could get a good glimpse of those deliciously crisp potatoes. We're going away to England next week, so this was a meal of "use up all the stuff in the fridge so nothing will go off" necessity. I made roasted potatoes and a beefed up version of American-style baked beans, and it was gorgeous. I got a thumps up from Cormac, my measure of delicious, so I thought I'd share it here-- in spite of the fact that the photo doesn't do the taste justice. 1. Cook up your ham/bacon in a large pot. Add garlic. 2. Remove from and lower heat, add your beer, molasses, ketchup/bbq, dijon, brown sugar, worchester sauce and stir well. 3. Return to heat, add chopped tomatoes and chopped red pepper. Add rinsed beans. 4. Let simmer on low heat for 30 minutes to 1 hour. The longer, the better-- but keep stirring so nothing sticks to your pot (or maybe you have such a nice non-stick pot that its none of your concern, but I don't, so be forewarned). That left over bacon I used in the beans was left over from our Valentine's Day breakfast-- from which I saved the bacon grease. It was very little, and I'm sure if you replace that little bit with more olive oil these will turn out just fine. toss it all together on a pan, sprinkle potatoes with a tiny bit of polenta, cook 30-45 minutes at 180C (350F). Stir them around occasionally to keep them from sticking. If they are sticking too much, you need more oil. 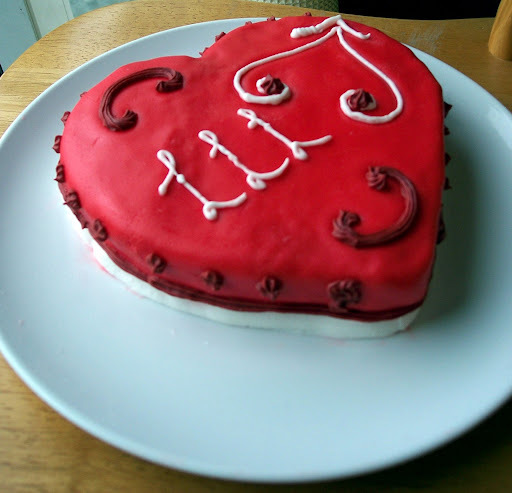 Red Velvet Cake made for promotion at my last LLL meeting. 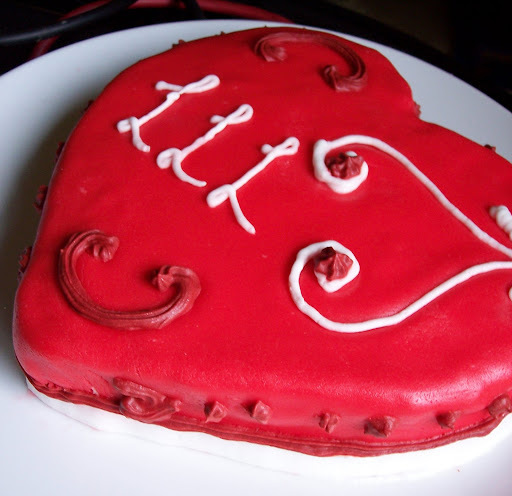 Red marshmallow fondant, decorated with royal icing. Vanilla buttercream filling. The cake went down great and I ever got an order from it! Preheat oven to 350°F. This recipe can make 2 8-9" round cakes or ~24 cupcakes. 1. Sift the cake flour. 2. Cream butter and sugar. Add eggs one at a time. 3. In another bowl, whisk cocoa, red food colouring, and vanilla. 4. Add to creamed mixture. 5. Stir salt into buttermilk, add to your batter alternating with the flour. 6. Combine vinegar and baking soda and fold into your batter. For cupcakes, bake about 20 minutes. For cakes, bake 30-40 minutes. (alternatively you can use one of those cans of premade cream cheese icing from the grocery store). Mix together with your hands and refrigerate. I melted a large bar of cadbury's milk chocolate in a double boiler, and used two spoons to cover my balls. I probably didn't use enough chocolate so they were sticking a lot. I don't like keeping extra chocolate in the house if you know what I mean! 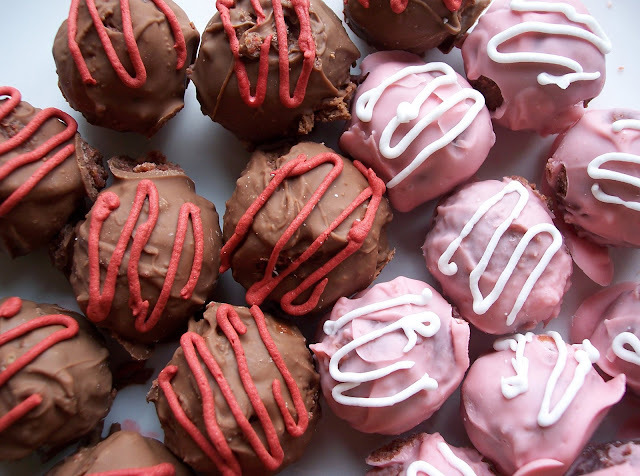 The pink balls were melted strawberry chocolate chips from Ardkeen Food Stores. 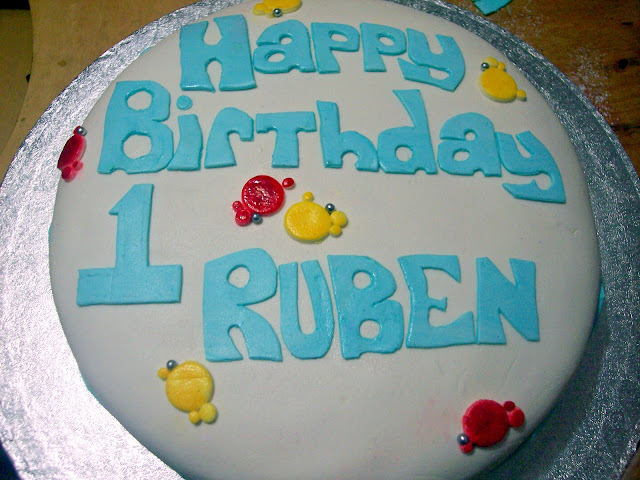 This is the first "1st Birthday" cake I've made, and sold today. 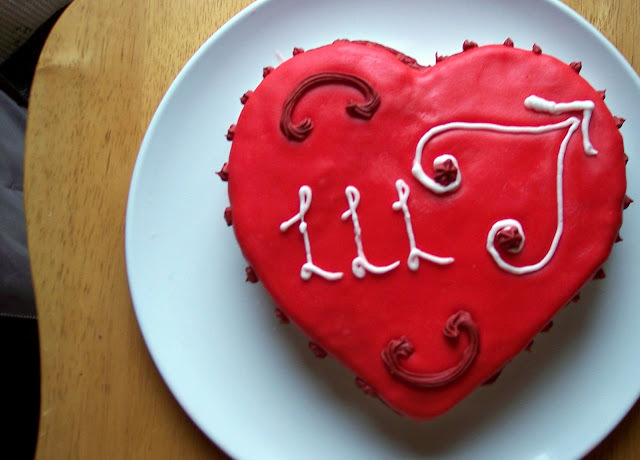 I desperately undercharged after I thought about my ingredients and the time I put into the cake, but that's alright. 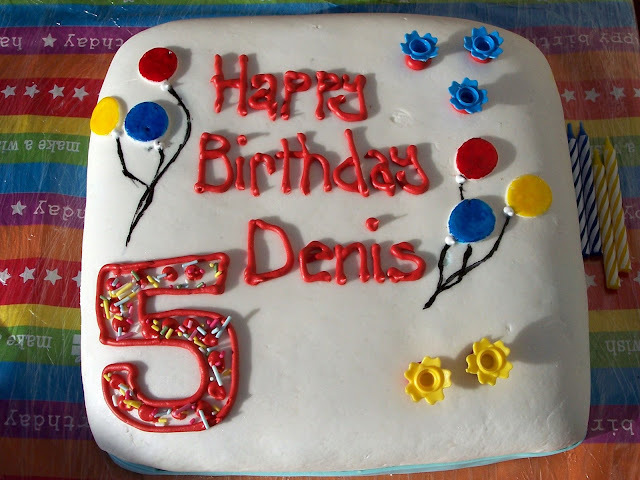 I knew the customer and it was great practice with the fondant. 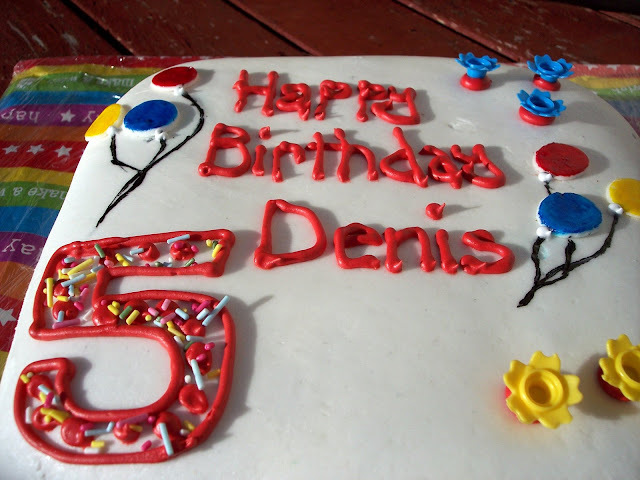 Now I know why most cake decorators buy the crappy tasting stuff. Oh well- I'd rather be proud of the work and the taste. 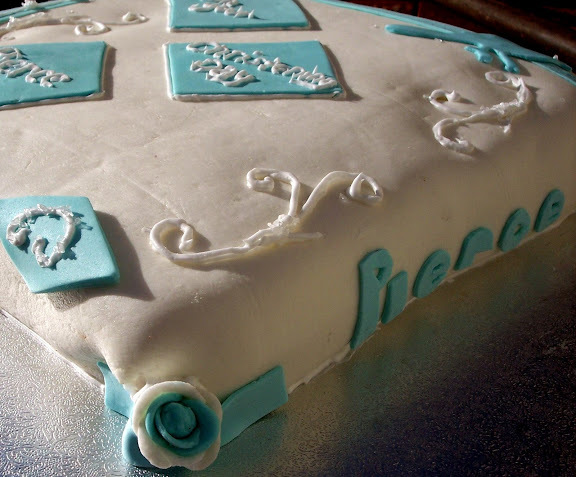 This is a moist chocolate cake with vanilla buttercream filling, covered in buttercream and fondant. 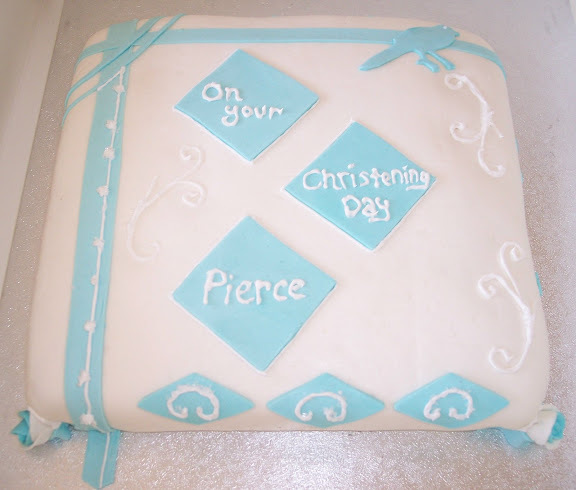 It's the same cake I'm making today and tomorrow for a Christening which I'll post by tomorrow. Again, I apologize for the quality of the photos. I blame it on lack of natural light this dim winter! 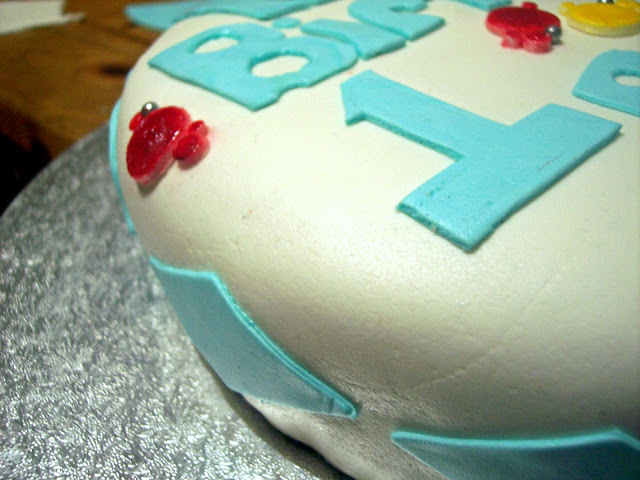 I'm mostly annoyed that the light/flash bounces off any of the moist bits- those decorations don't actually appear so wet. The letters on this one were probably a tad too big. I wasn't completely happy with the text. 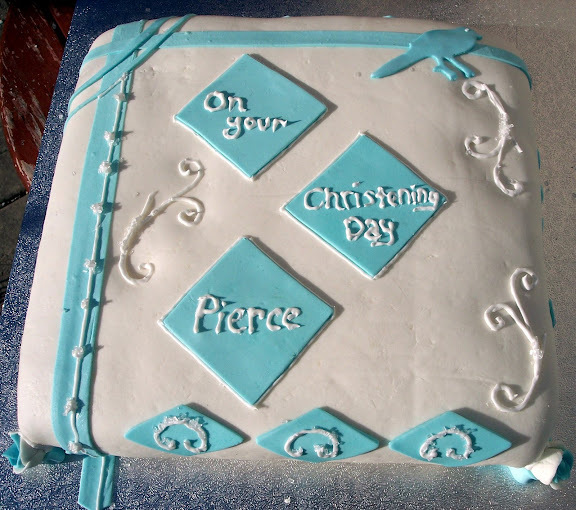 I want to get some letter punches, but sometimes the bubble letters turn out great (see the 'Breda' cake). The customer was delighted, though, so that's all that matters!